Damn you, St. Louis! Damn your exploding cocktail scene, three-and-a-half years after I move away. Damn you and your 150-libations-long cocktail menus and your Tales of the Cocktail award noms, your Ted Kilgores, your envy-inducing, membership-only cocktail boites that just happen to be housed in the most awesomest speakeasy-style restaurant space EVER. And damn the recent cover story in Alive Magazine (a local lifestyle rag for chicks with meticulously maintained blonde highlights that I make fun of a lot in my head, but still) listing the top 20 cocktails in the city, which just so happened to be the current issue when I swung through town a few weeks ago, reeling as I customarily do from the timewarp-mindfuck that comes from revisiting my once-hometown, coupled with the fact that I'm still pregnant and can't shouldn't really no damnit can't drink anyway. You are killing me Saint Louis. So yes, raging jealousy was my default reaction to this fine piece of journalism, followed closely by an intense desire to recreate at least one of these 20-best potations. I settled on the Month-Old Manhattan because, like many cocktails I've made of late, I already had all of the ingredients in the house. I haven't toyed with aging a cocktail in a while. 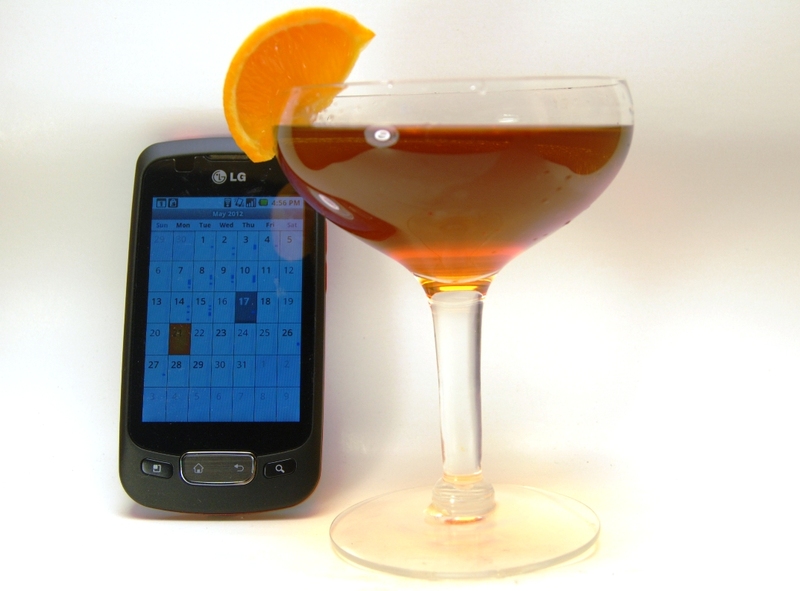 The Month-Old Manhattan recipe came from Eclipse Restaurant, owned by my old bud Joe Edwards. Joe Edwards is the king of the Loop, one of StL's happening-est nabes. Joe Edwards is a gentle, aging hippie and a shrewd, wickedly successful entrepreneur, whose hospitality and entertainment empire speaks to his endless love for all things Americana kitsch: Blueberry Hill (a resto/bar/college hangout/music venue where Chuck Berry still performs); Pin-Up Bowl; Flamingo Bowl; and the Moonrise Hotel, which houses Eclipse. I got to know Joe Edwards back when I was the restaurant critic at StL's alt-weekly. Also, Joe Edwards went to Duke. Go to hell, Carolina, go to hell! So we mixed up the M.O.M. and found it's got a hell of a lot going for it besides its titular aging. This Manhattan is made with rye whiskey (as was the norm back in the day), sweet vermouth, bitters -- and, curiously, curacao. If I had Grand Marnier on hand I'd use that (Grand Marnier being a most upscale curacao) but I went downmarket and just used no-name triple sec. Even unaged and no-name-triple-sec'd, I am already a big fan of this drink. 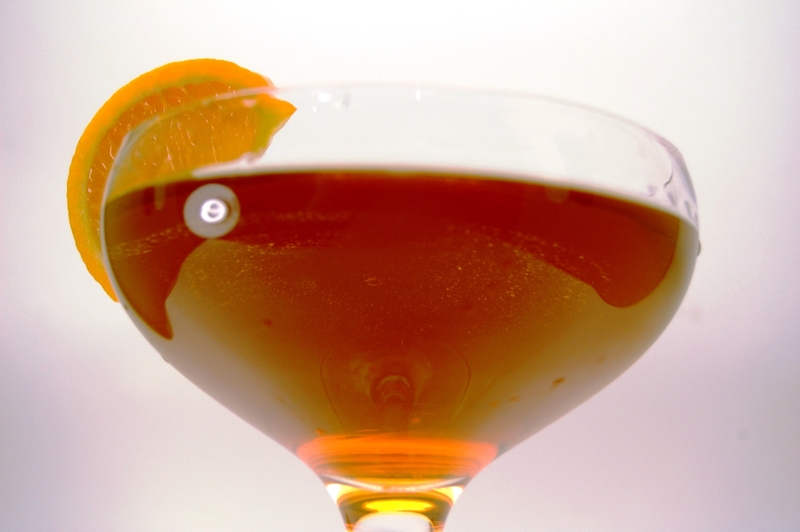 The rye-curacao combo offers a rare scratchy-smooth-sweet trifecta on the palate. 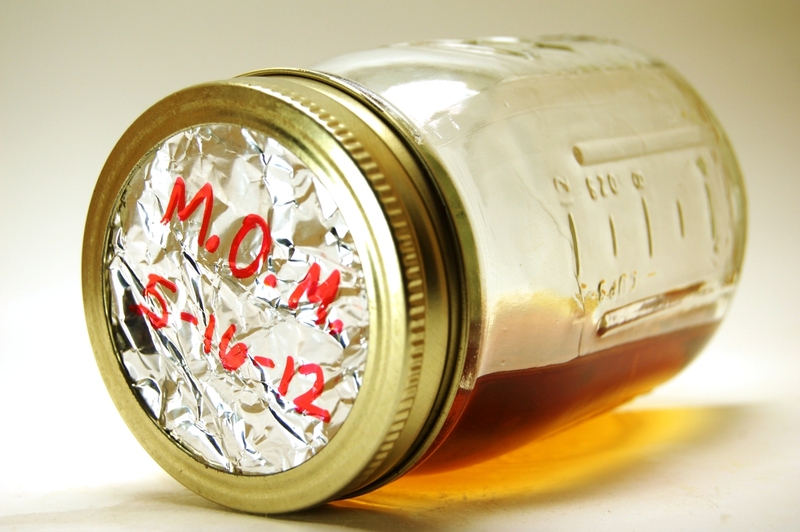 To make your aging sample, combine all liquid ingredients in a clean Mason jar, stir briskly and briefly with a bar spoon (no ice necessary), and tightly seal jar lid. Let stand one month in a cool, dark place like a cupboard. To drink straight away, stir all ingredients in an ice-filled mixing glass briskly for about 20 seconds, then strain into a chilled cocktail glass. Garnish with an orange or clementine segment, if desired. Like I said, I was happily surprised by the smoothness and well-calibrated sweetness of the M.O.M. even using crappy triple sec, so I can only imagine that going with GrandMa as your curacao would knock your socks off. In fact, you might even want to try scaling back to 1/2 ounce GrandMa if you do so -- I'm just guessing on that, though. Cointreau would, of course, be a fine, middle-of-the-road substitute between those two.